With the regular season wrapping up, it's time to consider the candidates for each of the league's regular season awards. We finish with the Kia Most Valuable Player Award. The Antetokounmpo/Harden debate is fascinating, and there's probably no wrong answer. 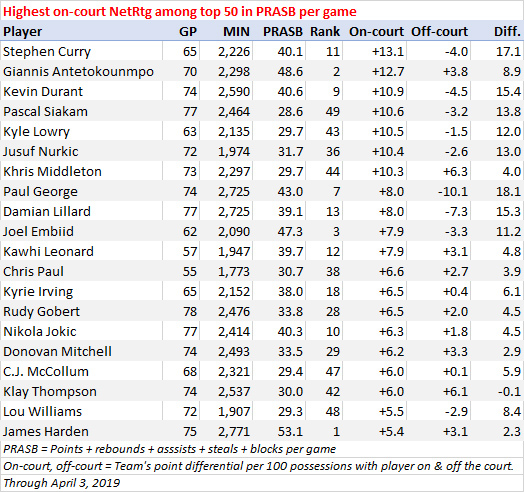 Both Giannis Antetokounmpo and James Harden are the primary drivers of their teams' success. The case for Harden begins with usage, that he has carried such a large load for the No. 2 offense in the league. The case for Antetokounmpo begins with the standings, and that he the role he has played in the Milwaukee Bucks being just the third team in the last *23 years to rank in the top three on both ends of the floor. * 23 years (since the 1996-97 season) is the timeframe for which we have play-by-play and shot location data. The other two teams that have ranked in the top three in both offensive and defensive efficiency are the 2014-15 Warriors and the 2016-17 Warriors. Harden also leads the league in usage rate. In fact, his usage rate of 39.6 perent is the second highest in the last 23 years. When Russell Westbrook had a 40.0 percent usage rate two seasons ago, his team ranked 15th in offensive efficiency. 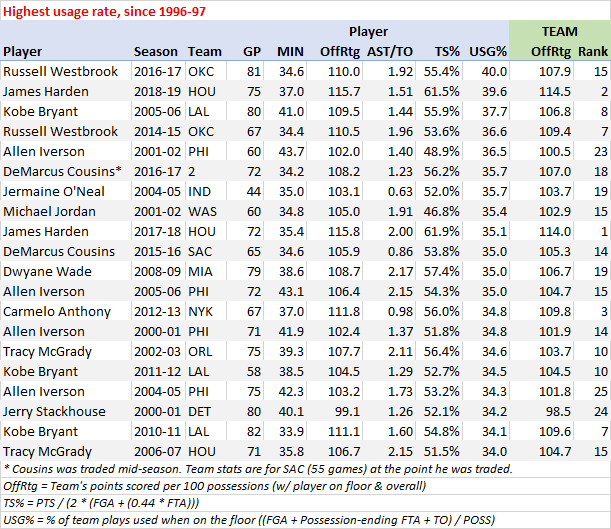 Harden has the second highest usage rate of the last 23 years for a team that ranks second offensively. He (both this season and last season) and Carmelo Anthony (in 2012-13) are the only players with one of the 20 highest usage rates of the last 23 years for offenses that ranked in the top five that season. Harden has the second highest true shooting percentage among the group, only topped by James Harden (last season). And the third highest mark among the group (Dwyane Wade in 2008-09) isn't really close. Among the 35 players with a usage rate of 25 percent or higher this season, Harden ranks sixth in true shooting percentage. Here are the true shooting percentage leaders among the 172 players with at least 500 field goal attempts. 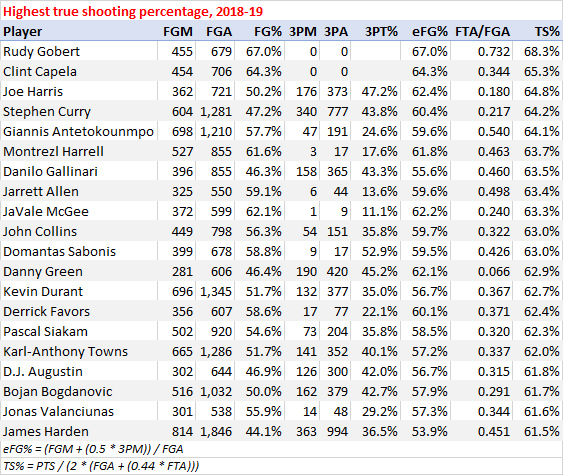 Through Wednesday (Thursday, PHL time), the true shooting percentage marks for Stephen Curry (64.2 percent) and Antetokounmpo (64.1 percent) would rank 15th and 16th all-time among players with at least 1,000 field goal attempts in a single season. The highest is Curry's mark of 66.9 percent in 2015-16. The two MVP frontrunners can each be turnover-prone. Among the 35 players with a usage rate of 25 percent or higher, Antetokounmpo (1.55) and Harden (1.51) rank 24th and 26th, respectively, in assist/turnover ratio. The leaders in assists points created per game are similar to the leaders in assists per game, though a player is a little higher on the list if his team takes a lot of three-pointers. Antetokounmpo (242) has more assists on threes than Harden (212). But Harden has more than twice as many assists on dunks and layups (323) than Antetokounmpo (131). In fact, 57 percent of Harden's assists have come on buckets in the restricted area. That's the third highest rate among 42 players with at least 300 total assists. Of course, one of the two higher rates (58 percent) belongs to Khris Middleton, because he gets to assist Antetokounmpo, who has scored 16.0 points per game in the restricted area, the most for any player in the 23 years for which we have shot location data. 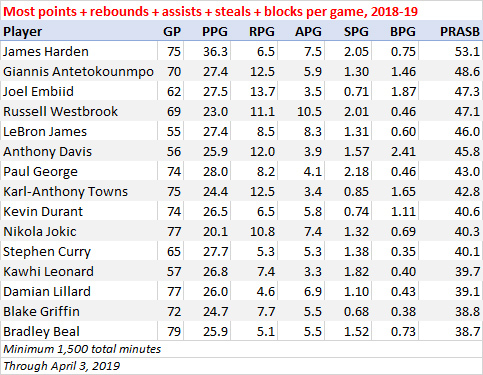 Steals and blocks aren't everything on defense, though you will find every likely candidate for Defensive Player of the Year in the top 20 in steals + blocks per game. Antetokounmpo leads the league in total plus-minus, with the Bucks having outscored their opponents by 627 points with him on the floor. On a per-possession basis, he ranks third (among players who have averaged at least 20 minutes in 50 games or more), behind Danny Green (plus-13.1) and Curry (plus-13.1), with the Bucks having outscored their opponents by 12.7 points per 100 possessions with him on the floor. The difference between how a team plays with a player on the court vs. with him off the court can give you an idea of how valuable he is, though context (who's replacing him in the lineup, who the player is on the floor with, and who the replacement is on the floor with) is helpful.